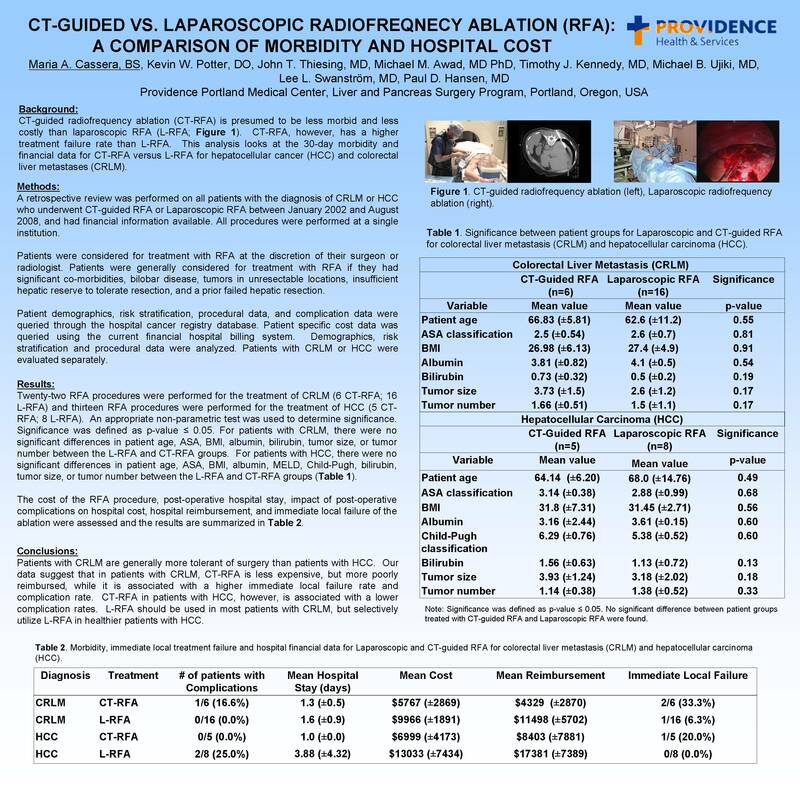 Background: CT-guided radiofrequency ablation (CT-RFA) is presumed to be less morbid and less costly than laparoscopic RFA (L-RFA). CT-RFA, however, has a higher treatment failure rate than L-RFA. This analysis looks at the 30-day morbidity and financial data for CT-RFA versus L-RFA for hepatocellular cancer (HCC) and colorectal liver metastases (CRLM). Methods: All patients with the diagnosis of CRLM or HCC who underwent CT-RFA or L-RFA at our institution between 2002-2008, were reviewed retrospectively. Demographics, risk stratification and procedural data were analyzed. Hospital financial data was queried for total cost, reimbursement and itemized departmental charges. Patients with CRLM or HCC were evaluated separately. Results: Twenty-two RFA procedures were performed for the treatment of CRLM (6 CT-RFA; 16 L-RFA) and 15 RFA procedures were performed for the treatment of HCC (5 CT-RFA; 8 L-RFA). For patients with CRLM, there were no significant differences in patient age (p=0.55), ASA (p=0.81), BMI (p=0.91), albumin (p=0.54), bilirubin (p=0.19), tumor size (p=0.17), or tumor number (p=0.17) between those who underwent L-RFA or CT-RFA. For patients with HCC, there were no significant differences in patient age (p=0.49), ASA (p=0.68), BMI (p=0.56), albumin (p=0.60), MELD (p=0.09), Child-Pugh (p=0.60), bilirubin (p=0.13), tumor size (p=0.18), or tumor number (p=0.33) between those who underwent L-RFA and CT-RFA. One patient had a complication in the CRLM group (CT-RFA), and two patients had complications in the HCC group (L-RFA). Immediate local ablation failures occurred in 2/6 of the CRLM CT-RFA patients, 1/16 CRLM L-RFA patients, 1/5 HCC CT-RFA patients, and 0/8 HCC L-RFA patients. Hospital financial data is summarized in Table 1. Conclusion: Patients with CRLM are generally more tolerant of surgery than patients with HCC. Our data suggests that in patients with CRLM, CT-RFA is less expensive but poorly reimbursed, while it is associated with a higher rate of complications and immediate local ablation failures. CT-RFA in patients with HCC, however, is associated with a lower complication rates. L-RFA should be used in most patients with CRLM, but selectively utilize L-RFA in healthier patients with HCC.